February 14, 2014 by Dreamz Unlimited! Valentine’s Day has always been one of the most special days in a year when, leaving all the important work, we spend time with people whom we actually love and care. Love is an eternal bliss which emerges from within. Love is the only thing that has freedom of our will. Nobody has ever loved anyone forcefully. Because it is simply impossible. It’s a feeling that evolves when you actually want it to. 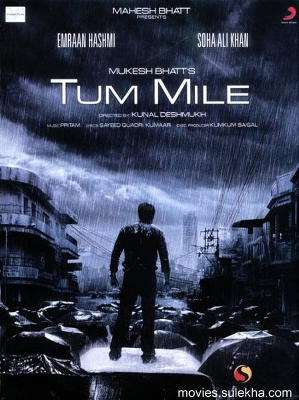 Five years back, in 2009, when music director Pritam had just become the top most and busiest composer of Bollywood, Tum Mile was one of those albums that made him what he is. After the successful collaboration with one of the most talented directors of Vishesh Films, Kunal Deshmukh in Jannat, Pritam teamed up again with him in Tum Mile, a love story set against the backdrop of the infamous July 2005 Mumbai Floods. Sadly the film sank badly at the box office as it was not well directed but its soundtrack became one of the most memorable romantic albums ever! It was the time when Neeraj Shridhar was Pritam’s favorite singer. There used to be hardly any of his albums in which Neeraj Shridhar wasn’t featured. It was because of his velvety vocals that can be fitted anywhere in any situation. He has led the song and also given the backing vocals so there’s no need to hire a voice for the chorus or backing vocals. Neeraj Shridhar is a complete voice. The first version is an upbeat foot tapping track which defines love in a happy-go-lucky way. It’s actually a romantic song in which you can easily show some moves. The tune has a wave-like structure. Simple beats are used with some undertones that makes it more interesting. A very sweet techno tune is played in the part come around. It doesn’t have the Vishesh Films sound which gives a very fresh and warm feeling. Only Piano has a prominent role and the rest of the song has techno sounds. It doesn’t have the antara-mukhda scenario, instead it has three stanzas, like Western songs have, first two having the same notes, the third one having different. The second version i.e the Love Reprise which is sung by Javed Ali. This version has a more relaxing and nonchalant melody compared to the former. Beautiful Saxophone has been played at the starting and in-between the song. That Saxophone is adorable which makes the mood more romantic. Sitar also shows its little presence after the Saxophone. Javed Ali’s vocals is so damn soothing that it’s hard to stop listening in a loop. Beats are even more soothing than that of Neeraj’s version. Unlike, the former version, it does have the antara-mukhda structure. The romantic breezy melody turns to the Rock side in the second interlude with Guitar being played at its best. Along with the tune, the lyrics also have a softer version and quite appropriate to sing while proposing your beloved. The third version is titled as the Rock version. Shafqat Amanat Ali’s classical vocals blend quite amazingly with the Rock-ish feel of the song. The version is similar to Javed Ali’s Reprise version with Rock Guitar arrangements in the background quite firmly placed. I didn’t feel the need for this version as the tune of the song is melodious and doesn’t suit Rock music but Pritam has managed it so well that it’s hard to say anything bad about it. The Guitars have been played in “Life In A Metro” style and the sound which Pritam has produced with the Guitar at the starting and the end of the song is something extraordinary! Three completely different but beautiful flavors of a single tune and Kumaar’s romantically aligned lyrics. Tasty! A love ballad with a rhythmic tune perfectly written by Sayeed Quadri. It’s all about the Piano. The way it starts, it keeps you engage till it finishes off. KK’s engaging vocals won’t allow you to concentrate on the beautiful background. Pritam has used some of the finest backgrounds sounds here. In the first interlude, there comes a vocal sound which is undefinable. It has a kind of sound played with the Violin that only Pritam can produce and I miss that sound in his melodies now. The antara is sweet and superb where KK rocks. The second interlude has Suzanne giving the backing vocals which takes the song to another level and also helps to connect well with the second antara which is superbly written. Melody is damn catchy and breathtaking. It ends quite smoothly with the part which I like the most i.e the vocals of Suzanne crooning the same tune that is played with Piano in the intro. The Rock version starts with a bang that has again Piano but with a different tune. It sounds good too but soon emerges to be a duller version. Pritam has perfectly used all the Rock elements and given it a completely different sound. To be precise, the Rock version is awesome but compared to its counterpart, it is dull and boring not because it has any drawback but because the former version is something out-of-the-world. You tasted it? Then don’t just stick to KK. Make your ear familiar with awesome backgrounds that you wouldn’t have heard anywhere in Bollywood. That Guitar strums, and then that steam-engine-like sound and then comes one of the most addictive sounds/tunes I have ever heard in my life. This melody leaves a deep impact to its listeners. Pritam has crossed the limit of addiction in this song. Again, a wave-like tune which produces great emotions and also a foot to tap rhythmically. Beats have been arranged in a particular one-two-one-two manner which beautifies the song. Pritam has helped him showcase his versatility by making Javed sing in a totally different pitch and voice tenor, as opposed to what is normally associated with him. It also has a Sufi touch beautifully blended in it by featuring Ashraf and Shadab accompanying Javed in the chorus line. That haunting flute deserves a special mention which is rightly should be called as totally Nasheela. The backing vocals taking an alaap just before the second antara is outstanding! I guess, it’s Javed only doing that. It’s hard to imagine how Pritam must have had told Javed to do that. An Immortal Melody. A Bliss! A breathy delightful melody which provides the mood for a road trip. It has a little different gesture compared to other songs of the album. It’s lively and westernized. Melody is beautiful again, but that level which other songs offered was absent. It starts with a Mandolin giving a fine intro to the song. In the interlude, the breezy Saxophone makes things better. Pritam has made Mohit Chauhan do the Kishore Kumar – like “yodling” in the end which gives the feeling that we have heard something really good. Mohit Chauhan has helped a lot in taking the song to another level with upbeat rhythm and classy backing vocals. In this genre, what I like the most about Pritam that he always ends the antara in a rhythmic format by creating a nice bridge that leaves the antara safely to the mukhda. Other composers never follow this and leaves off the antara blatantly. A journey song that feels fresh because of Mohit Chauhan. Starts with KK’s impressive vocals and Sayeed Quadri’s rhythmic lyrics and as KK goes high-pitched, you can’t think of any other thing in your life apart from this track. It’s a gem of a tune! It’s amazing how Pritam has managed the sound so well that the part which has a dull tune i.e o meri jaan, he has used a haunting Piano piece that surely vainsh the dullness and you would be lost in its beauty. The antara is also catchy and extremely melodious. Beats are passionately romantic. Though Sayeed Quadri has written perfect lyrics as it’s a sad separation song but the beauty with which Pritam has made it, you would keep on adoring it and forget it to be a sad song. The second interlude is filled with all the haunting vocals that is a typical Vishesh Films sound and the way KK ends that antara, tanha teri tarah, haan main bhi hoon, that’s something what listeners look for. Not only a heart-touching but a heart-wrenching melody that would keep you mesmerized with its music and emotionally moaned with its lyrics. This instrumental track has some beautiful haunting sound. Saz supports the Violin aptly to help it perform being the lead instrument. Endearing! Tum Mile wasn’t a soundtrack that contained variety as most of the Pritam albums do these days. But it surely is the most melodious album in Pritam’s career which displays its simplicity in the best way. 3 versions of the title track, passionate melody Dil Ibaadat, addictive Sufi melody Tu Hi Haqeeqat, sweet and simple road trip track Is Jahaan Mein and the gem O Meri Jaan. It got huge praise from critics as well as the listeners. Pritam also got nomination for Best Music in Star Screen Awards along with two other nominations Love Aaj Kal and Ajab Prem Ki Ghazab Kahaani. 2009 was the year when Pritam showed the higher level of his presence in Bollywood and started getting the much deserved respect along with the praise that he always used to get. But sadly, this album didn’t get the respect it needed. One of the Best Romantic albums ever! But the Most Underrated album ever! Because there’s a thick line between the amount of praise it deserved and the amount of praise it actually got. The album which gave birth to some immortal tunes! Vishesh Films’ Best Soundtrack till date! February 9, 2014 by Dreamz Unlimited! When I thought of shortlisting six best romantic soundtracks from each of the six eras that Bollywood music has witnessed, I wasn’t sure of which album to choose from 80’s and then I found the most deserving album of that era. The album that changed the path of Bollywood music and brought back the melodious tunes that were absent for a long time. The movie marked the debut of Mr. Perfectionist Aamir Khan who became the nation’s heartthrob. The period when dramatic action was on its peak, this movie restarted the romantic trend which has always been the specialty of Bollywood. Anand and Milind Srivastav, the duo brothers who are the son of famous retro composer Chitragupt, created the melodies that was needed the most at that time. They produced a new sound and gave a new shape to Bollywood music that later became the identity of 90’s music. Starts with a Violin, this romantic track has still that clutching power which makes the listeners pay attention to it. Guitar has been played very well specially the small riffs after the lines like tere toh hain hum. Antara is catchy and passionately melodious. Alka Yagnik and Udit Narayan are in their top form delivering a additional melody to it through their vocals. It is a more regular song, which benefits with meaningful lyrics and a bit of experimentation from Anand-Milind. The song still ends up a bit slow and is made more to help the proceedings in the film. Its tune has been said to be inspired from the instrumental number “Return to the Alamo” by the band The Shadows. It however, doesn’t sound to be inspired at all as the composers have aptly covered it with the Indian cloth. Lyrics has the love saga which depicts the dependency of two lovers on each other. The lovers’ song of 80’s. Mukhra is comparatively less melodious than antara. That’s quite evident when a beautifully played Mandolin is heard and the sweet tune of antara paves the entry for Alka Yagnik. The song’s beauty lies in its rhythm. Tabla and Dholak have been used as the percussion and that seems to be the most interesting element in the track. The rhythm that has been used, was the first of its kind which later provided the same pattern for many tracks. The young vocals of Udit Narayan and Alka Yagnik perfectly enhanced the light dholak base. The refrains of “Manzil pyaar ki” are at the very least touching and exhibit a talent to compose hit romantic songs that many of the eighties styled music composers displayed. Anand-Milind also do a lot with very less, just using the guitar, the dholak and the excellent singing duo of Udit and Alka they have created one of Bollywood’s most memorable duets. The track could have been more interesting but it was enough to be discussed and played everywhere at that time. The Violin has been played in a quiet 70’s way and also has sounded brilliant. Listen it for the awesome rhythm. A song that has Alka making promises to Udit. The song changes its mainstream tunes frequently to prevent it from becoming too slow, something that is evidently possible. It’s more of Alka’s song because she has sounded damn beautiful. Udit Narayan, on the other hand has a less role and didn’t impress much. Sound of the rhythm has been well crafted and improvised as it is sounding like a 2000’s track. It’s prelude and interludes are quite famous and are played in the background of short films or shows. The orchestration is amazing. Portions of this song are adapted from “Play Me” by Neil Diamond. A romantic song that you can still listen just for the technical aspects. It starts off with Alka in classical form to proceed to nothing more but a two minute vocal exercise. Here, Anand-Milind have used almost the same gesture of Sitar playing which their father Chitragupta used to play. The tune is quite endearing and melodious. Because of the way the instruments are used, it sounds like a 50’s melody. Lyrics are just situation oriented though likable. Alka Yagnik has ruled the song. She has sung exceptionally well. Pretty short, but sweet nonetheless. This song in its original and sad version is a stage song that many have tried to re-create today. It completely belongs to Udit for which Anand-Milind just support with excellent Guitar use. The song is immensely catchy and ultimately became a winner after the film scored. It is still one of the most popular Bollywood tracks ever. Many versions, many parodies have been tried but the original one has no comparison. The lyrics have been written keeping Aamir Khan in mind, a guy who preaches romanticism. It has been filmed at situation of college farewell day. The trumpet played, gained huge popularity. The first antara is written about what others want and would do in their life. The second antara tells his own feelings about love that he believes love to be the highest supremacy. The Immortal Song. Qayamat Se Qayamat Tak is one of the best romantic film albums ever. Most importantly, its music had started attracting people who detached themselves from the ear-unfriendly tunes of 80’s. This album brought the melodies back and made people satisfy about the future of Bollywood music. Surely, Nazir Hussain knew what good music was in his long career of Bollywood musicals and Mansoor Khan too never lost emphasis of the power of music, but at most it was the few numbers that made soundtracks strike gold, Qayamat Se Qayamat Tak has that and in some sense a little more. The soundtrack also followed a trend having only two singers in its entirety, in which two, but the excellent Udit Narayan and Alka Yagnik. It was Anand-Milind’s best work. They got their first and only Filmfare for this album. Udit Narayan had also grabbed it for Best Singer for Papa Kehte Hain. A soundtrack that acted as the savior for music from the ignoring 80’s music. I chose it among the six best romantic albums, being the best romantic album of 80’s, just because it turned the path of Bollywood music and people again started to be excited for an upcoming album. February 2, 2014 by Dreamz Unlimited! 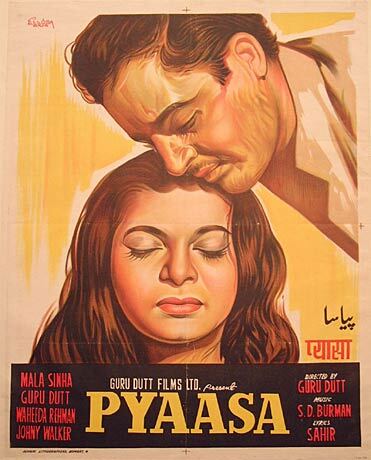 1957 was the lucky year for Hindi Cinema as Pyaasa, the cult classic movie was released that year. Directed by Guru Dutt, who was also the lead protagonist in the film, Pyaasa regarded as one of the best films in India ever made. Pyaasa was ranked at #160 on the Sight & Sound critics’ and directors’ poll of all-time greatest films. In 2005, Pyaasa was rated as one of the 100 best films of all time by Time Magazine, which called it “the soulfully romantic of the lot.” Indiatimes Movies ranks the movie amongst the Top 25 Must See Bollywood Films. On the occasion of Valentine’s Day 2011 Time magazine has declared it as one of the top 10 romantic movies of all time. This film was remade in Tamil, Telugu, Malyalam and Kannada. It’s music became highly popular and it is called one of the best collaborations of a composer and a lyricist. It’s a romantic track with a tinge of comedy in it and the comedy is depicted in its lyrics. If lyrics get the praise, music is no less. It has a funny sound attached to it. A sound by an instrument which is played after every line to give the song a happy mood. Geeta Dutt’s voice also sounds marvelous.The recording has been done with sheer carelessness. It’s even hard to notice the percussion used in it. You can call it a Romantic-Comedy song of that time. It’s an immortal song. A song which is heard by every child, every grown-up in the streets and enjoyed equally. It’s based on hair massage. The lyrics have been written with care, depicting the reality that no matter how great a person becomes, he has to bend down his head in front of a massage man. And that is actually true. Either a person is a beggar or a CEO of a Multi-National company, he wants to be massaged for relaxation. No matter what’s the reason of sadness, a massage in the hairs, makes people feel happy and relieved from numerous tensions which they are tackling with. The line Laakh dukhon ki ek dawa hai, kyun na aazmaaye is lyrically and musically strong and effective. The way it acts as the bridge to come down to the mukhda, is phenomenal. This line became one of the most famous Hindi phrases of all time. It is based on a tune from British Movie ‘Harry Black’, which was later released in India as ‘Harry Black and The Tiger’. S. D. Burman was initially not happy in copying a western tune but later changed it so well that when the producer of the ‘Harry Black and the Tiger’ visited India, he heard the song and not only failed to recognize the tune, but commended him on it. You should listen to each and every line of this to understand the simplicity of its lyrics and what a great thought it provides. It was added to the movie on behest of distributors to bring some relief in rather pessimist film. It was never planned in original cut. This three antara track has sweet, breezy, simple and catchy tone which sounds damn cute and innocent. A perfect coordination is there between Rafi and Geeta Dutt. It has a conversational lyrics which gives a slight comic touch to the song. The rhythm is amazing according to the time it was made. The antara goes high and Rafi has managed that part very well. The mukhda and antara are so beautifully merged in each other that there doesn’t seem to be any bridge made to connect the two. Breezy romantic track, would be loved by all. Jaane woh kaise log they, jinke pyaar ko pyaar mila, humne toh jab kaliyaan maangi, kaanto ka haar mila. This is absolutely my favorite song from this album. It is one of the best sad songs ever made in Bollywood. It has been composed and written straight from the heart. There doesn’t seem to be any moment in the song which would be consciously made. Everything is so smoothly done that one can think if the lyricist and the composer had created the whole song in the first attempt. That ting ting ting sound, I don’t know how they had done that. It brings a smile on our face. I am unable to understand what instrument has been used but the sound is so melodious that you won’t be able to leave it in the middle. I also applaud Hemant Kumar for his flawless singing. His voice has a sweet melancholy which justifies the mood of the song. This one has a bit complex tune, unlike others which were catchy enough to grow in the very first listening. Flute and Violin has been coordinated well. Unlike other tracks, which didn’t focus on percussion, this one has a unique combo of Tabla and Matka. Though Matka can be heard quite easily, for Tabla, more concentration is needed as it is mashed up with the sound of Matka so well that Tabla is sounding as Matka at times. Geeta Dutt’s singing is adorable. It’s quite difficult to sing and she did it effortlessly. Song’s less popularity is because of a complex tune. It’s quite a strange song where the instruments had been used in a minimal way. Just the Violin is played at subsequent times. Mohammed Rafi rules it as the singer is the prime instrument here. The same tune has been repeated constantly throughout the song. It can be said that there is no antara, instead, there are many mukhda so the lyrics played the most important role. The description of each and everything thing related to those who are proud of their nation and nowhere to be found, is fabulous. What level of thinking must have been done, we can imagine! Well, we cannot. It is to be listened in complete silence to understand the depth. I have to applaud the writing more than the music. What an exceptional writing has been done! The lead protagonist is disheartened with this materialistic world which is full of betrayals and backstabbing. I salute the lyrics and regard it one of the best lyrics ever. Rafi has justified the sadness in it and sung it giving the appropriate expressions and emotions. After each antara, a loud Violin is played which sounds strange and also causes disturbance in the sad mood. The loud Violin after the last antara is justifying as the song gets louder and it suits that situation. A song which has got something to learn about the real world. Starts with a beautiful Violin, It’s not actually a song. It’s a kind of short poetry. Though it has a definite tune, but seems to sound slightly similar to yeh duniya and jinhe naaz hai.Sitar and Accordion are the additional instruments here. The lyrics have been written in the shayari way. It’s all about praise of the beloved. It should have been made into a full length track instead of creating just some lines. The length is, I guess, is the reason for it’s unpopularity. Short but beautiful. Shayari lovers would love it. After few male tracks, here’s again Geeta Dutt rendering a solo melody. The percussion has been used impressively well that makes the rhythm foot tapping. Along with Violin, which shows its strong presence, a mild Flute has been played in the background that helps in getting more beauty. Lyrics seems to be quite forceful here, as there doesn’t seem to be any firm thought evolved from it. I loved its arrangements compared to other songs. Percussion is the highlight of this track. I was waiting for the song to start but it didn’t. It’s a short song in which Rafi croons some lines from Sahir Ludhianvi’s Shayari and you would be just wondering and hoping for the moment when Tabla would finally starts but it doesn’t. This ghazal by Sahir Ludhianvi was also used in the film “Light House” (1958). In “Light House”, the ghazal was composed by Datta Naik and sung by Asha Bhosle. The tune is so beautifully made that it feels sad after knowing that there’s nothing more after that. It also sounds incomplete. It might be according to the situation in the movie but they could have made a full song and included that only in the soundtrack. But then I remember, that there used to happen nothing like that. The recording for the film and the cassette used to be same. Beautiful tune, but the incompleteness disappoints. Pyaasa is still considered one of the best soundtracks of all time. Anyone, after listening to it, would say this. It has one of the best romantic melodies which are not inclined to typical Bollywood romance but presents a different approach towards romance. Jaane Woh Kaise was surely the best song from the album because its melody was the most beautiful among all. Besides, Hum Aapki Aankhon Mein, which was added later on the behest of distributors, none of the song spreads optimism. Every song has its own melancholy because the movie had a really pessimistic story line. This was the last film in which S.D. Burman and Sahir Ludhianvi worked together. Their estrangement was a result of Sahir claiming that the film’s success was more due to his lyrics than due to Burman’s music. In 2004, the soundtrack for Pyaasa was chosen as one of “The Best Music in Film” by Sight & Sound, the British Film Institute magazine. Yes, it really is one of the best film soundtracks ever! January 19, 2014 by Dreamz Unlimited! It was the mid 90’s era when the passionate love was the favorite theme of filmmakers. It was the time when a lover couldn’t think of a relationship to be casual. Seriousness always used to be there in relationships. Before coming into relationship, hero had to struggle a lot to impress his beloved. And the main issue was to convince parents. That was the serious 90’s love which also was there in this musical hit film Dilwale. Nadeem-Shravan were one of the most popular duos in the industry. They used to get serious romantic scripts that used to have passion and sadness in love. Back in the mid 90’s, when Kumar Sanu was at the top of his career and his songs used to be in every music chart, this song added more to everything. It has everything that a super hit 90’s track should have. The violin orchestra, Dholak and Guitar to which Santoor added more pleasure. It’s a song that is heard almost by every Indian. They mustn’t have listened consciously but it is still so famous that you can hear it anytime anywhere on any autorickshaw or bus or in any shop. I am sure all must have heard it in these places only. The lyrics is something that a mango person can connect it with himself. One of the most popular from Nadeem-Shravan. It’s a song even more popular and much better also. The tune is purely a 90’s melody but it sounds really good. It also has amazing arrangements. The basic mood of the song is Sad but a particular sad version is also there. In the other two so-called happy version, one has tha the other has hoon. Kumar Sanu sounds apt in all the versions. The tha version has Guitar and Violin but Shehnaayi adds the sadness that it needed. The recording work has been done amazingly in this version. The hoon version is ofcourse happier compared to other two so it has beautiful Santoor and Accordion played in the background. The sad version has Harmonica aptly increasing the sadness in the atmosphere and Kumar Sanu’s singing is a great support for changing the listeners’ mood. Dholak has been used in all the versions as without it, no Nadeem-Shravan song would have been made. Alka Yagnik, in two versions is superb. At the end of all the versions, there’s amazing work done with Piano and that is surely the best past of the song. Lyrics are written according to the different situations and it has also worked sonically well. It is still the one of the most remembered songs of 90’s. How they made all three versions differently, that’s a thing to listen for. It starts with loudly played Violin and percussion but as it moved further, it turned out to be a Romantic-Sad song. Udit Narayan comea on the mike replacing Kumar Sanu and delivers a great track along with Alka Yagnik. Along with Guitar, Accordion is used in the first interlude and Been in the second. The tune has comparatively lower intensity as compared to the two previous tracks. It is also a less popular track but was a hit of its era. Lyrics are very ordinary and do not add any charm to the song. An ordinary track now, but one of the best of 1994. Kumar Sanu returns in this title track. The tune is ordinary but somehow it sounds nice. It seemed to be a perfect ideal romantic track of 90’s. Been, Tabla and Accordion are used here also but in a better way this time. Lyrics are not all suitable for the tune composed. Many times it went out of the rhythm which sounded very odd and uncomfortable to ears. It seemed that Nadeem-Shravan didn’t work much with this track and compromised with whatever made in the first effort. A song not at all applicable in today’s musical world. It has a much faster rhythm and better tune compared to other songs. The rhythm and tune are catchy and have ability to hold the listener. The I love you part has slightly similar tune to the I love you part of Meri Soni from Yaadon Ki Baaraat. Violin is played beautifully. Arrangement has been done in a planned way unlike other tracks. The Kumar Sanu – Alka Yagnik jodi bounded the soundtrack well and this song is the best example for that. Nice! That’s all I can say. Dilwale was a squinter among the blinds in that year. It had nothing creative or beautiful or fresh but it surely had a sound that was better than its contemporaries. Two songs Kitna Haseen Chehra and Jeeta Tha Jiske Liye were the among the best of 1994 and one of the most popular songs of 90’s which are still played in every second shop you visit or the vehicle you travel. That was also the beginning period of Kumar Sanu – Alka Yagnik jodi that later spread deep magic through every song. Dilwale was hit at the Box Office and was the 8th grossing movie of 1994, collected around 5, 00, 00, 000. It was a Nadeem-Shravan time which, if you missed, you won’t be able to like it again. January 12, 2014 by Dreamz Unlimited! 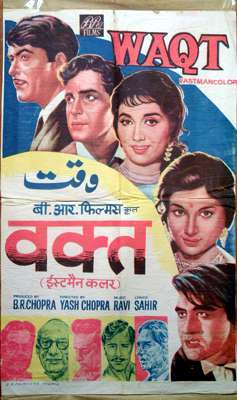 That dramatic family bonding trend that we saw in Kabhi Khushi Kabhie Gham or Baghban or Hum Saath Saath Hain, was started long ago in 1965 with this film Waqt. Many get confused it to be a BR Chopra film. He had produced it only. It was directed by Yash Chopra. It was his third film as a director. I grew up watching it and listening to its songs. It had the class that is seen in today’s family movies. Some of the finest starcast was used. A story that connected very well and so was Ravi’s music. The songs had that charm and melody that still freshens up our mood. Also, Waqt was the highest grossing movie of 1965. As a current generation, when I listened to it, I feel the same pleasure that is felt after listening to a short song Zara Si Mehndi Laga Lo in the film Mausam. In both the tracks, instruments are very lightly played and the leading instrument is the voice of the singers. No percussion has been used. It has just a Sitar and a mild Violin orchestra. Asha Bhosle sang with utter sweetness and Mahendra Kapoor’s voice sounded soothing. The tune is beautiful and spreads the much needed peace in the atmosphere. Lyrics are a sweet conversation between the two. Close your eyes and play this song, you’ll be stress free. It’s an ordinary party song. When I say party, it doesn’t mean a club where everyone is on the floor putting their hands up in the air or driving themselves crazy. By a party song of 1965, it is clear that everybody is standing still, their eyes are fixed on a lady who is singing a love song and its lyrics are pointing towards her beloved who is currently playing Piano to accompany her. A perfect melodramatic scene but you just have to enjoy good music. I don’t have any right to even comment anything on it. If something exists beyond immortality, it is in that zone. It’s a cult classic song which can never die. Manna Dey has sung in such a way that it can make an insensitive person melt in seconds. Its lyrics have a big role in contributing towards its immortality. Sahir Ludhianvi has poured out the feelings of every old man who wants to make his wife know how much he still loves her. It is appeared to be a typical Bollywood romantic fun song but actually it’s a song based on a classical raga Pilu. It’s a very unpopular raga which is mostly used in light-classical forms of north Indian classical style. I know, everybody has heard it but check out the technical part of the track now, you’ll be amazed! It’s a nice melodious romantic song which has Santoor used as a prelude and interlude instrument. It starts with a very short alaap by Mahendra Kapoor who sounded very similar to Rafi. His voice texture is quite similar to that of him. But when he sings the upper notes, one can easily identify that it is not Rafi. It’s purely an Asha Bhosle song. She rules it. Her voice in antara sounded damn awesome. The second antara has been sung by both of them together and that really beautifies it. Lyrics are pure and not forceful. This one is based on the raga Pahadi. Doesn’t seem so, right! A song perfect for Asha Bhosle fans. This tune is so beautifully made by Ravi that it touches the heart of those who have one. Some may find it boring, others may find it too slow and depressing but it is surely not any of that. It’s a soulful sad song that very well connects with the listener. Rafi has done the justification with the composition. Lyrics are written according to the situation. What an amazing work Sahir Ludhianvi has done. It’s all written about how time has all the powers and nobody has control over it. If you find this boring, well I can’t do anything for it. A very simple but beautiful tune rendered perfectly by Asha Bhosle. Her vocals in this song have little less sweetness and more bluntness. Though she sounded little odd but that oddness turned into the beauty of the song. A brilliant use of Sitar and Xylophone has been done along with Violin. It is based on the raga Pahadi. Tabla is used in appropriate places. I like mukhda better than antara as mukhda is quite engaging and is filled with more variations. Lyrics again have words related to the situation. She sings Kaun aaya ki nigaahon mein chamak jaag uthi and there he enters. Perfect timing. To enjoy it more, watch it in the movie. Its rhythm is quite similar to that of Kaun Aaya and its arrangements are similar to that of Hum Jabse Simat Ke. Also, it is based on the same raga Pahadi. Although it’s composed by combining some of the elements of some of the songs, it doesn’t lose its own identity. The tune is fresh and sounds perfect with rhythm used. I felt Rafi would have been a better choice in place of Mahendra Kapoor. Unlike Hum Jabse Simat ke, in this, his vocals have revealed its identity. He didn’t sound similar to Rafi this time. But I guess, that worked somehow against him as it loses the much required sooth. The lalala part in third antara had a bit annoying effect. This chorus sound steals away the romanticism of the song for the time it is played. But what lyrics! Oh man! Superb lyrics by Sahir Ludhianvi. If you listen to 60s music very often, only then you’ll like it. This comes out to be a winner in terms of creativity. It doesn’t seem to be a Ravi composition. It has more of a RD Burman sound. Guess what, this is also based on raga Pahadi. Now that comes as surprise. When you listen to the song, it has orchestration completely different from other tracks. It has a western sound and also Saxophone and Violin are used in western style. The song is based on a classical raga. That’s a thing to imagine how Ravi created a song on the same raga and made it sound purely western. Lyrics here are powerful which has some of the most thought provoking and inspirational lines. Asha Bhosle rules the track. Only she could have sung this kind of song at that time. The way she says peechhe bhiiii… I don’t think Ravi had told her this but I think it’s a part of her own creativity. I am sure you have heard this, but if you haven’t, do lsiten, immediately. Waqt was a soundtrack that had immense melody and pure and spontaneous lyrics. It was one of the best combos ever of music and lyrics. Six out of eight songs are based on classical ragas, among which five of them are based on raga Pahadi the remaining one song is based on raga Pilu. Most of its songs are still very popular. Zohra Jabeen has a different kind of popularity but songs like Aage Bhi Jaane Na Tu or Kaun Aaya are still popular but not among youths. The previous generation are a big fan of this album. Sadly, Ravi didn’t get Filmfare nomination for this album but he won the award in that same year for his music in Khandan. Though it didn’t win awards in music category, it won 5 Filmfare Awards – Best Director, Best Supporting Actor, Best Story, Best Dialogue and Best Cinematography. Have you ever wondered Zohra Jabeen is of which movie? Have you ever tried to listen the rest of the songs from that album? No? It’s the right time to hear some of the greatest melodies blended with inspiring and thoughtful lyrics. January 5, 2014 by Dreamz Unlimited! It was the year 2002 when the Hindi film music sound was in a transition mode. We were getting out of the 90’s effect and moving towards Pop music. Kaho Naa Pyaar Hai (2000) and Dil Chahta Hai (2001) played the most important role in changing the sound. A new era of music was taking birth. New composers were knocking the doors of Bollywood. Out of many, two composers forming a duo entered the industry with a promise to make their place permanently fixed. Jeet Ganguly and Pritam Chakraborty. Mere Yaar Ki Shaadi Hai was their first big project. They were comfortable as they were working for a friend’s movie. Sanjay Gadhvi, their close friend was directing it. They not only made a chartbuster compositions but also created some immortal tunes that still connect to us quite well. We were in the process of getting out of the 90’s zone but we hadn’t got fully out of it. This song clearly depicts that. It was a typical 90’s YRF element which had an essence of DDLJ sound. It starts with an alaap by Alka Yagnik. It was the main track of the album as the signature tune of the album is the tune of this song. This tune has been played using Mandolin which creates the DDLJ effect. That was amazing! They were Jeet and Pritam. They weren’t Jatin-Lalit yet they created sounds exactly similar to that of Jatin-Lalit. The rhythm also had all the Yash Raj elements. Udit Narayan’s vocals suited this song perfectly. When the signature tune is played after the first interlude, the Mandolin is mixed with Matka. That’s the best part in the song. Javed Akhtar has written this song very well. There doesn’t seem to have any forceful words or sentences. The whole song seems to be written in a planned way depicting the qualities and activities of the girl mentioned in the song. A song full of sanctity. This KK-Sunidhi combo that has been used by Pritam later several times, was first tested in this grooving track. I remember how we used to dance on it and how fast it would seem to us. Now when you hear it, you can’t dance on it. Today’s dance songs are incredibly fast. But when you peep into that era where these kind of songs were nowhere to be made, you would surely realize how awesome it was to compose such a track. It had all those modern sounds that are still used. KK sounded too awesome to ignore. Sunidhi’s performance was less convincing. She has sung in a false voice that sounded annoying after a certain time. The best thing in the track was the intro tune by Violin that was played many times in the song. Listen, to know how techno sounds got place in Bollywood. If you have listened to the song before, you would definitely get a nostalgia. It has the cuteness and the innocence which makes a unique bond with its listeners. It also has the Jatin-Lalit sound. The composition is totally fresh and a light beauty is there hidden in the tune of mukhda. Udit Narayan here also created immense impact with his vocals which suited the song very well. The rhythm is purely 90’s and gives a good feeling. It also made me wonder why this rhythm is not used in today’s songs. It creates a peaceful impact. All the instruments used here belong to 90’s era. The best part of the song is that before both antara, the signature tune is played and Alka Yagnik takes a very short alaap and the antara begins. Lyrics are very well written. He has written situation oriented lyrics and has made it quite funny. This track belongs to Sonu Nigam. He completely captured the whole song. He starts on a slow note and then just impresses everyone with his singing. Now this song has little variation from 90’s music. You can hear the orchestra, the background which is a modern sound. The Guitar has also been played differently. The interludes though are again filled with all the Jatin-Lalit sounds. Sitar is played beautifully before the second antara. Sonu Nigam’s vocals sounded damn classy. Credit goes to composers for echoing his vocals in the hook line. That’s a unique beauty of this song. Udit Narayan has got the second antara and it is somehow less interesting. This song didn’t seem to be suited on him. Alka Yagnik is perfect throughout. A Soothing and Relaxing Romantic Song. This title track was a wedding song which was composed exactly in Jatin-Lalit style (haha). It’s a typical melodramatic song that used to be there in films at that time. It’s very difficult to compose another song on the same words Mere Yaar Ki Shaadi Hai when already a song of this name had become a rage. A very nice effort from Jeet and Pritam. The track has immense melody and emotions. Dholak, Dhol, Nagada, Shehnaayi, Sarod, Mandolin and Guitar all are used making it a lengthy song. Again the same trio of Udit-Sonu-Alka is there. Lyrics are decent. Arrangements are superb. The best part in the song is Alka’s part saathi soona. This one was as good as the old Mere Yaar Ki Shaadi Hai was. The soundtrack ends on the best note with the best song of the album. This song had marked the comeback of Asha Bhosle to mainstream music. The addictive Guitar tune was a paradigm of how Pritam would compose some awesome addictive songs in future. I wonder how this song still sounds so fresh. The beats, the arrangements, the singing, infact the whole structure of the song sounds fresh. The decision of roping Asha Bhosle for singing it, would be surely one of the best decisions Jeet and Pritam have taken in their life. One can still dance on it quite easily. It has grooving beats but also has soothing effect that still has made the song alive in our hearts. Though in the soundtrack version, there’s no Sonu Nigam but in the film version, he has sung the mukhda. Every line, every note is composed and written with awesome addictive feeling. A track to salute. Mere Yaar Ki Shaadi Hai was a soundtrack that had all genres of songs. All the popular singers of that time have been used. Jeet and Pritam would have made a great combo in future and this is the best example of that. The composers seemed to be inspired by Jatin-Lalit’s music and aimed to become like them. But it wasn’t written in the kundli of the industry and the listeners to listen more from them. They worked on one more film after this and then separated. No body knows the exact reason for separation but whatever happens, happens for good. They both are doing excellent job in their field. It was good that they separated and we got to hear new sounds from both of them otherwise, if they hadn’t separated, they could have landed being just another Jatin-Lalit. This album got trapped in between 90’s and 2000’s music but emerged out to be a memorable one. By God’s grace and my readers’ support, Musical Sameekshaa completed its very first year on Nov 20. It was a beautiful year as my music reviews got appreciation from all. Recently, Musical Sameekshaa completed its 10,000 views and 200 followers. It was the time when I decided to start a new section in my blog. A section where I’ll be writing about some albums of past that were highly popular among music lovers and also some unfortunate underrated albums that were excellent but didn’t get the deserved appreciation. Every Sunday, I’ll write about two such albums of which one will be from 1950’s, 1960’s and 1970’s and the other will be from 1980’s, 1990’s and 2000’s. I hope you all will like this new section BLAST FROM PAST. Yesterday was RD Burman’s death anniversary. The music director who died 20 years ago, on January 4, 1994, is still the most popular music director in India. You ask a 5 year old boy “Do you know who is RD Burman?” and he’ll reply in “yes”. He was the creator of the modern Hindi music. He gave birth to a sound that was heard never before in Bollywood. Almost all his albums are remembered even today. His songs are liked by today’s youth. 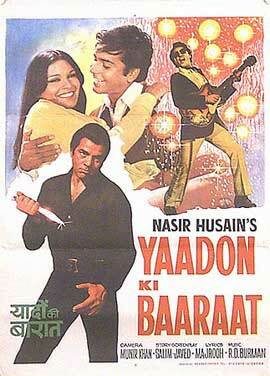 Of all the brilliant albums that he composed, one was one of the most famous of all, Yaadon Ki Baraat. This two version title track was one of the biggest hits of that time. The first version is in the casting of the film. It starts with an alaap by Lata Mangeshkar. The tune is very simple but catchy. The rhythm is of typical RD Burman style. The coordination of Lataji with the child singers is a thing to listen. The lalala in the antara is damn cute. The child singers are Padmini Kohlapure who later became a successful actress and also sang some songs; the other is Sushma Shreshtha who later became a successful singer and her debut song as a child singer was Hai Na Bolo Bolo from Andaz. Aamir Khan also appeared first time on screen as one of the children in this song. The best thing in the track is the bridge which connects the antara to the mukhda. That is exceptionally well. The next version is sung by Rafi and Kishore da. There are very few tracks in which these two top singers have sung together. This version is a little less popular. It starts with a tuning-folk like sound. This version sounds more melodramatic. Moreover, the positive feeling we get from the former version, is absent in this. It also must be the fewest of the few songs in which Kishore Kumar has sounded better than Rafi. Kishore Kumar’s vocals have saved this version. The best part of that version was the bridge I was talking about and that is not there in this. That has made it sound incomplete. A child-like tune with mature arrangements. He had this unique quality of using ambient sounds in his compositions. This one is no different. It starts with a sound of playing with a spoon. Then that Guitar which we all are fan of. was inspired by the English song, If It’s Tuesday, This Must Be Belgium from the soundtrack of the 1969 film by the same name. Here also, arrangements are too fab. The saxophone has been played so aptly. It’s a song that is still played in parties and create a vibe among the youths. The creation of that vibe should be credited to Asha Bhosle. What stupendous singing she has done. She created the right amount of sexiness in her voice being simple at the same time. After singing the whole mukhda, when she slowly says chura liya, one can sit and think for hours how she had done that! The second antara paves the entry for Mohammad Rafi who sounded much better than in Yaadon Ki Baaraat. He has also maintained the addictive singing level. He also ends the song very well. Its lyrics became highly popular and when you listen to it, you get to know why. One of the most Addictive songs ever. One can easily tell that it’s an RD Burman song from its intro. The hoo type of vocal effect was his signature style. The instrumental part is quite long. After one and a half minute, Kishore Kumar starts singing. The sounds used here is a video game type of sounds. Specially in both the interludes, very weird kind of sounds have been used. The mukhda is catchy and simple too. I like the way both the antara begin and that is seriously enjoyable. In the antara, the yahan part sounds too good. That increases the energy level of the already energized track. Lyrics is nice but doesn’t leave a long impression. The antara is the part of the song that you can’t ignore. When I read its name, I wondered why I had never head about this song though I already had listened to rest of the songs. When I listened to it, I understood why. I also understood why it is the least popular track of this highly popular album. When you listen to the track, you would understand that there must be a situation of a show in the movie where the protagonist would be singing on the stage. Surprisingly, the tune fells short of that level which other songs are. But the better part is that the track has been made with complete reality and nothing has been recorded which doesn’t sound real. Like, when Kishore Kumar calls the girl from the audience and when she hesitates to sing, that sounded very real. What sounded more real was when he asks the audience to sing with him and they were unable to match with the music. All that gave me a positive feeling for this song inspite of not-so-good tune which becomes more weird later in the song. A song not made for listening but for watching in the movie. It’s another super hit track which was a favorite for the youths of that time. Kishore Kumar rules the composition. He sang extremely awesome. The Guitar and the Violin have been played amazingly. The starting Guitar riff is a notable one. Though it lacks a little creativity compared to other songs, but it’s an addictive tune. If we like it so much today inspite of having number of romantic tracks in our library, just imagine how mad the youth would be for this song in that year. Listen it for Kishor Kaumar’s attractive vocals. Yaadon Ki Baaraat was a soundtrack that connected with its listeners very well. It was one of the best albums of 1973. Sadly, RD Burman didn’t get to win the Filmfare Award as he lost to his father SD Burman who won for Abhimaan and Panchamda had to satisfy himself with the nomination only. RD Burman’s music was one of the major factors in the film’s huge success. Chura Liya Hai Tumne being the most famous track, has shaken up everyone with its vibe. If the songs were recorded well, it would be sounding as fresh as a 2014 album.